Candidates for the award must be faculty members at one of 10 participating Kansas and Oklahoma universities with demonstrated success in their field and must have mentored a substantial number of junior faculty, postdoctoral fellows, or graduate or undergraduate students. The award was established in 2012 to recognize someone with demonstrated commitment to fostering the intellectual, creative, scholarly and professional growth of mentees. The award's namesake, Joan S. Hunt, is professor emeritus of anatomy and cell biology at the University of Kansas Medical Center and the original principal investigator of K-INBRE. "I couldn't be happier and more grateful to K-INBRE for this great honor. Being compared to someone like Dr. Hunt, who has had such a positive influence on so many people over her career, is both humbling and gratifying," Clem said. According to the nomination letter from Vice President for Research Peter Dorhout, Clem has seamlessly integrated mentoring into research and teaching activities during his 19 years at K-State. He has mentored four tenure-track assistant professors, eight postdoctoral researchers, 16 graduate students, and 33 undergraduate researchers while conducting his own research on mosquito-borne viruses. Clem specializes in molecular and biochemical techniques to investigate cellular processes that contribute to antiviral defense and to determine why only certain mosquitoes are able to spread viruses. He has more than 70 publications and 8,700 citations, and he serves on numerous journal editorial boards. Clem is currently serving as a rotating program director for the National Science Foundation, where he manages the Symbiosis, Defense, and Self-recognition Program. Clem was honored at a Jan. 14 awards banquet and will receive $5,000 to be used for research and/or mentoring activities. He plans to use the funds to help current mentees attend conferences and present their research. He knows the value of good mentoring from personal experience and said he finds helping others reach their potential incredibly rewarding. "When I first started graduate school, I initially did not receive very good mentoring, and although I didn't realize it until later, it really did hold me back. Later I was fortunate to be able to join the research group of Dr. Lois Miller, who was a fantastic mentor in every way and to whom I owe a great debt. Having received both poor and excellent mentoring, I know what a difference being a good mentor makes in the careers of young scientists, and so I take the responsibility very seriously," Clem said. The National Institutes of Health-funded K-INBRE program works to improve Kansas biomedical researchers' competitiveness for NIH research grants and to develop the next generation of biomedical researchers through undergraduate training and mentorship. Brian Spooner, director of the Division of Biology, said Clem has helped K-INBRE accomplish its goals. "Professor Clem is an outstanding faculty member who excels in all aspects of academia. 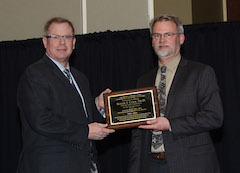 He has been recognized for his quality research and superb teaching, and, with the Hunt Award, for his outstanding mentoring, at all levels; undergraduate students, graduate students, postdoctoral scientists, and junior faculty members," Spooner said. "He is a terrific faculty member, and brings great credit to the Division of Biology, the College of Arts and Sciences, and Kansas State University," he said. Find more information about the program. K-INBRE is a multidisciplinary network designed to inspire undergraduates to pursue careers in biomedical research, enhance research capacity through faculty development and retention and expand the biomedical research infrastructure connecting several academic institutions. This program was made possible by an Institutional Development Award from the National Institute of General Medical Sciences of the National Institutes of Health under grant number P20 GM103418.